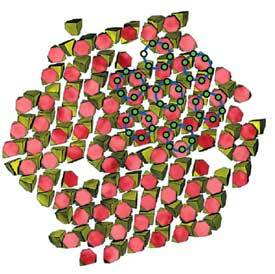 (Nanowerk News) Crystalline nanoparticles of cadmium telluride, a semiconducting material used to make thin films for solar cells, spontaneously assemble into two-dimensional free-floating sheets in water without a template to guide them. Nicholas A. Kotov, Sharon C. Glotzer, and their colleagues at the University of Michigan, Ann Arbor, report this unexpected finding and explain how it occurs through a combination of interactive forces between the nanoparticles—the same way that some protein structures form in living systems (Science 2006, 314, 274). Nanoparticles generally can be coaxed into forming sheetlike layers, but doing so requires a template such as a solid surface or a liquid-liquid interface. When Kotov and Zhiyong Tang first observed CdTe's unassisted sheet-forming behavior several years ago, the researchers weren't sure how it was happening. They later reasoned that, because CdTe nanoparticles and surface-layer proteins found in bacterial cell walls share similar physical dimensions and nonspherical shapes, the CdTe nanoparticles might be mimicking proteins and self-organizing. Glotzer and Zhenli Zhang undertook a series of computer simulations to test this idea. They discovered that the unique tetrahedral shape of the CdTe nanoparticles indeed leads to a combination of anisotropic electrostatic and hydrophobic interactions that drives the spontaneous assembly of the CdTe nanoparticles. Experiments by Kotov's group showed that when any of these interactive forces are missing, the sheets don't form. The CdTe nanoparticles, stabilized by an alkanethiol, assemble in monolayers in aqueous solution with pieces of the sheets as large as 50 x 30 µm observed in micrograph images. The sheets luminesce from bright green to dark red when illuminated with UV light, depending on the nanoparticle size. Self-assembled, floating 2-D sheets of nanocrystals are "unexpected, surprising, and interesting," comments Moungi G. Bawendi of Massachusetts Institute of Technology. "The researchers did a beautiful job of correlating their observations with a more theoretical description of a potential mechanism." The research establishes an important connection between two basic building blocks in biology and nanotechnology, Glotzer and Kotov note, and is "very exciting" for a slew of possible applications, ranging from drug delivery to energy.